These quaint little cottages. These exclusive yet cozy cottages are situated in the garden that is nearest to the beach. Although we do recommend these cottages for just two people a third person/single bed can be accommodated at an extra charge. These cottages have a sit out as well. SWIMMING POOL, BEACH FRONT MULTICUSINE RESTAURANT, POOL BAR AND CAFE, WIFI IN RECEPTION AND RESTAURANT FREE OF CHARGE, MONEY EXCHANGE, DOCTOR ON CALL, LAUNDRY SERVICE, SUNBEDS AT POOL AND RESTAURANT. AC , TV , REFRIDGERATOR , SAFE DEPOSIT BOX. All rates are on Double Occupancy. Check in/ check out timings : Check in is at 1 pm and check out is at 11 am. Breakfast : is included in the hotel tariffs and is served in the beach restaurant between 07.30 am and 10.30 am. it is a buffet breakfast consisting of tea/coffee, choice of bread/toast, butter, jam, fruit juice, cereal, 2 egg dishes, 1 vegetarian Indian dish, vegetables and fruits. All our rooms are strictly non-smoking, however, smoking is allowed on the balconies. The restaurant is open from 07.30 am to 10.30 pm as well as room service. Friends of guests are strictly not allowed in the rooms. this is for your own safety. Pre-payment and cancellation : One nights advance payment is required to confirm the booking. This is non-refundable. 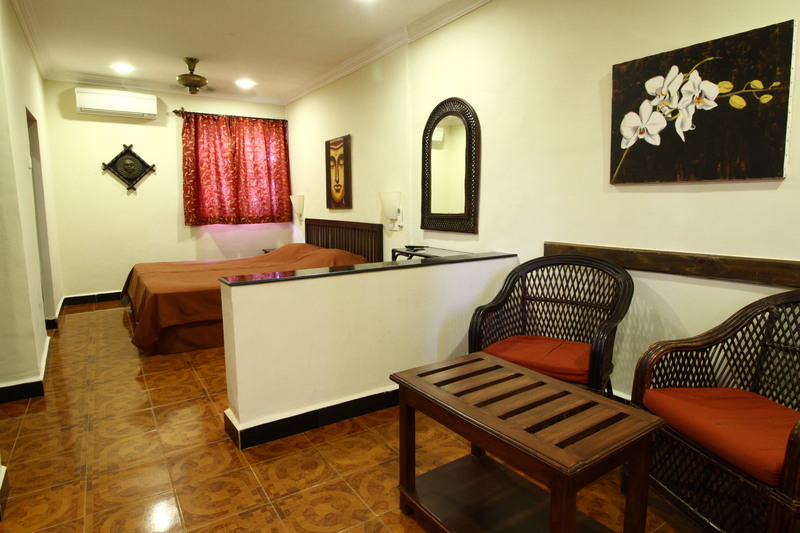 Extra pax : extra adult in the rooms carries and extra charge of Rs.1000. Extra child between the age of 6- 12 years carries an extra charge of Rs.500. Extra adult/child cannot be accommodated in the STANDARD AC ROOMS. Use of proper swimwear is compulsory in the swimming pool to maintain water quality. Outside food/drinks are not allowed on the hotel premises.